This week in my email there was a Groupon for a Paint Nite. It is a painting activity scheduled in a Pub: In just about two hours, while you’re sipping on a cocktail, our performing artists will guide you through each painting so that you come up with your own unique masterpiece at the end of the night that you will be amazed YOU created…You just bring your fun loving friends and have a few cocktails to keep the spirits high and inhibitions to a minimum and we’ll make sure your inner Picasso is unleashed. How did I manage to get through 4+ years of Art School without a drink?! Geeze – Do you think I could have earned better than an “A” with alcohol in my system? I know artists and musicians are considered “free-spirits” and “non-conformists”, but I realize after all these years since college (35), is that I am one of the few TRUE non-conformists in the world. I don’t do drugs. I don’t smoke. I don’t drink. I founded an art studio in the early 1990s, promoted musicians, added Coffeehouse in 2006. We were the most amazing and creative facility in the area — till an abuser became determined to destroy the joy. I had a Drink-n-Draw activity in the studio/coffeehouse 10 years ago, so I find this new Art and Alcohol activity amusing and annoying. Back in 2009, my mother and I displayed our picture book “A Box of Bears” (I’m the illustrator) at a downtown festival in a former bank along side a photographer, potter and painter. We met many people who were gracious enough to listen and hear how the story and illustrations evolved. We sold a handful of items. I walked out the front of the building and noticed a long, long, line of people forming on the opposite side of the street, stretching all the way from the middle of the main street intersection down the block. I inquired what the line-up was about from a gentleman who was also selling his illustrated book. He informed me that there was a special wine and beer tasting event scheduled at 2 pm. People had to sign up for it ahead of time, get the special bracelet, and wait in line to show they were of legal age to drink. I have never or probably will never drink any alcoholic beverage. Who would ever want to wait in a line that long just to get a drink? Wasn’t the event supposed to be a community arts & crafts day?! So, I went inside to let my mom know what all the fuss was about. I shook my head in disbelief for the condition of the human race. We haven’t evolved socially over the centuries. We just have technology to talk about it and take risks with the effects. We have become a culture that can’t get together socially without expecting some form of alcohol in our hands. There are signs outside of eating establishments with BYOB – as if 15 + different beverages they have aren’t enough of a choice and suitable for customers to consume. It’s enough to “drive you to drink.” But don’t drink and drive – difficult to do when you drove away from home to that event. This link to the newsletter from The Community Action Program of Lancaster County provides some wonderful insight into how women (yes, it’s still predominantly women) survive the destruction from domestic violence. I was intrigued by the article of the lady who housed pets for victims. It is interesting to note that there are MORE shelters for animals than for human victims of DV. When I needed assistance, town police were inept (duped with the con-manipulation) and there were no rooms available in any Lancaster County shelters. I also learned that a mother of 4 children couldn’t find a place to stay in the entire Philadelphia area. Carmel, my cat, had been locked from his litter box and food on the days I stayed away. My employee would discover this situation upon entering for her shift. 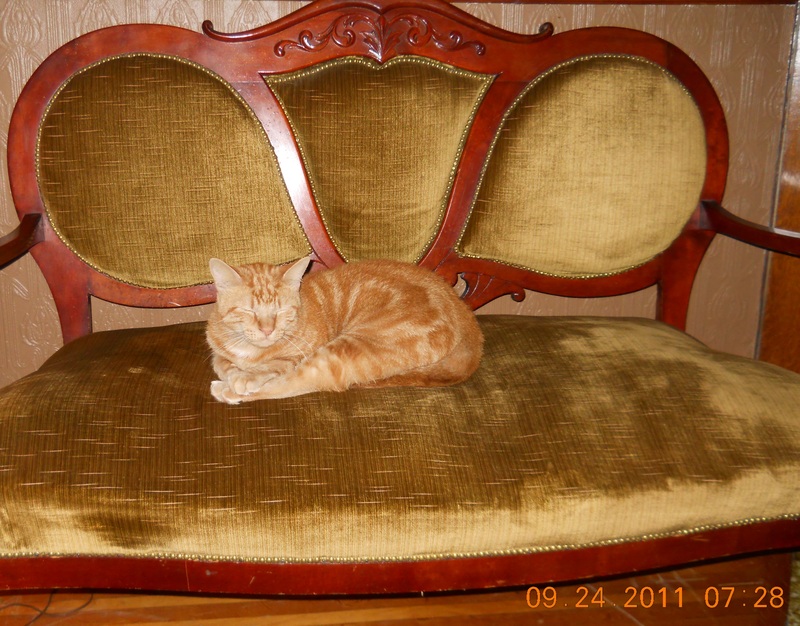 I was able to flee with my cat at the end of Sept 2011, to a home of a former customer. The family was willing to let Carmel stay with me for a couple days. Unfortunately the home owner got weird about her space. She began to think I might want to move in (no way) after she invited me to teach lessons in her sun room. She had her own dragons to slay . . . As it turned out, her husband rounded up volunteers to remove many of my belongings and put them in a free storage space for a year — very thoughtful, indeed. I had to move 1.5 hours away from the town I called home for 27 years. Three years have passed since I made the decision to end an abusive relationship. I was able to get out before the physical violence escalated. I kept my customers and employees safe — but we were out of work and my 7 businesses destroyed within 90 days. I’m still not completely free but Carmel is here with me today — watching as I write. He’s been my comfort cat through everything. His day of adoption is coming up early May. I can finally say that both Carmel and I are doing well 🙂 though we still need a home to call our own. Anybody got leads?